Ptolemy I (c. 366–283 B.C.E. ) was a Macedonian general under Alexander the Great (356–323 B.C.E. ) and founder of the Ptolemaic dynasty of Egypt, a family of fifteen kings—all of whom were named Ptolemy—who reigned over Egypt for more than three hundred years. Born in the upper Macedonian region of Eordaia to the Macedonian nobleman Lagos and Arsinoë, Ptolemy grew up in the royal court at Pella. Little is known about Ptolemy's childhood. In 343 B.C.E. he joined Alexander at Mieza where he studied for three years with the Greek philosopher Aristotle (384–322 B.C.E. ). Ptolemy returned to Pella with Alexander by 340 B.C.E. and supported his younger friend's quarrel with his father, Philip, the King of Macedonia. In 337 B.C.E. Alexander left Macedonia with his mother Olympias, Ptolemy, and his close friends for Epirus and Illyria but soon returned to Macedonia. Alexander's relationship with Philip remained sour, and the king forced Ptolemy from the court because he considered him a dangerous adviser to his son. In 336 B.C.E. when Philip was assassinated by a group of nobles, Ptolemy returned to the court and supported Alexander's claim to the throne. Alexander, in turn, appointed Ptolemy companion, lifeguard, and seneschal, an office in charge of the household and servants. Ptolemy accompanied Alexander on his military campaigns to regions in the Danube in 336 B.C.E. and to crush rebellion in Corinth and to destroy Thebes in 335 B.C.E. Asia Minor to free the eastern Greeks from the Persian Empire of Darius III (died 330 B.C.E. ) and to invade Syria and conquer Persia. Ptolemy fought at Issos in 333 B.C.E. and, riding beside Alexander, pursued Darius into the hills. He then accompanied Alexander through Phoenicia and in the conquering of Tyre in 332 B.C.E. and marched through Jerusalem to Egypt. In Egypt, Ptolemy aided Alexander's peaceful conquest of the country and the founding of the city of Alexandria, and probably accompanied his king to the temple of Zeus Ammon, in Siwa. Ptolemy quickly realized the immense value of Egypt, and he developed keen interests in the region. From Egypt, Ptolemy accompanied Alexander to northern Mesopotamia for the third and final major conflict with Darius's armies, at Gaugamela in 331 B.C.E. During the next six years Ptolemy campaigned with Alexander through western India and along the Indus Valley. Ptolemy recognized Alexander's claim to the Persian throne without hesitation and revealed to Alexander the plot of the royal pages (messengers) to assassinate him. In India, Ptolemy fought beside Alexander and in one battle saved his king's life. At Susa in 324 B.C.E. , when Alexander asked his companions to marry Persians, Ptolemy agreed and married Artacama, the daughter of the Persian nobleman Artabazos. But after Alexander's death Ptolemy quickly divorced her. With Alexander's death in Babylon on June 13, 323 B.C.E. , Ptolemy's political and military ambitions were freed. He quickly recognized the problems of co-rulership with Alexander's half brother Arrhidaeios—who suffered from mental and physical disabilities—and his son Alexander, who was born shortly after Alexander the Great's death. Ptolemy immediately claimed Egypt as his satrapy, meaning that he became governor of the province. Ptolemy also stood strongly opposed to Perdikkas, to whom Alexander had given his signet ring (a ring engraved with a seal) and the regency (governing power) of the empire. Ptolemy brought Alexander's body for burial to Memphis in Egypt, though Alexander had wished to be buried at Siwa. Ptolemy built an altar there for Alexander but kept the body at Memphis until a suitable mausoleum, or tomb, could be built in Ptolemy's new Egyptian capital, Alexandria. Perdikkas's regency rapidly fell to violent warfare among Ptolemy, Lysimachos who held Thrace, Antigonus (382–301 B.C.E. ) the "One-Eyed" in Greater Phrygia, and Seleucus who desired power in Syria. Until 281 B.C.E. the "successors" fought bitterly. In 306 B.C.E. Antigonus assumed the title of king and claimed all of Alexander's empire. In opposition, Ptolemy declared Egypt's independence, proclaimed himself king of Egypt, and established a powerful dynasty (a line of rulers from the same family) that would last until Cleopatra's (51–30 B.C.E. ) suicide in 30 B.C.E. After Ptolemy I divorced Artacama, he married the Macedonian noblewoman Eurydice. Unhappy with this political alliance, Ptolemy put her aside, and by 317 B.C.E. had married his widowed half-sister and lover, Berenice. The girl, a niece of Eurydice, was almost twenty-seven years younger than Ptolemy. Berenice gave birth to two children, Arsinoë (II) and Ptolemy (II). In Upper Egypt, Ptolemy I founded the city Ptolemais. As satrap of Egypt, he clashed violently with Cleomenes of Naucrates, whom Alexander in 332 B.C.E. had appointed financial manager of Egypt and chief of the eastern delta (lands east of the Nile River) and had entrusted with the completion of Alexandria. Cleomenes, however, had assumed the satrapship, but Alexander had relieved him from duty. In 321 B.C.E. Ptolemy charged Cleomenes with embezzlement of funds (stealing money) and executed him, thereby removing a political rival. Between 306 B.C.E. and 286 B.C.E. Ptolemy concentrated on the development of his empire. He gained control of Cyrene and conquered Palestine, coastal Syria, and Cyprus. In 286 B.C.E. he became protector of the southern Cycladic islands and their center at Delos. Throughout his empire he established the well-constructed Ptolemaic administration; he built the legal and military organizations and the military settlements, raised foreign armies, and raised native money for the military. Using Alexander's daily journal and other official materials, Ptolemy wrote an excellent history of Alexander and his campaigns. 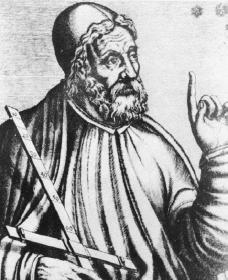 Greek historian Arrian's Anabasis (second century C. E.) preserved much of Ptolemy's study. In 285 B.C.E. Ptolemy stepped down from his throne in favor of his twenty-two-year-old son, Ptolemy II. Two years later Ptolemy I died and was deified (given god-like status) by the young king in 279 B.C.E. and given the title Theos Soter, "God and Savior." Bevan, Edwyn. The House of Ptolemy. Chicago: Argonaut, 1968. Ellis, Walter M. Ptolemy of Egypt. London; New York: Routledge, 1994. This article should be changed to the title "Ptolemy I Soter" rather than Ptolemy I, because it is easily confused with Ptolemy the Astronomer, therefore giving this website a "not credible" review because people are receiving incorrect information. If you could fix this issue by specifying that would be great. Thank you.